Any festival is a complicated endeavor to pull off. But you don’t need to worry about the backend because you’re just there to dance, dish and maybe talk someone cute into a worrying about your backend. There are a few things you should pay attention to when you’re getting ready for and finally get to EDC. We want you to ride up in style, rock out fearlessly and get your whole totem into the grounds so you can raise it high enough for Alesso to see it and the person behind you to get pissed. That’s your EDC Las Vegas right. Just imagine how fun it would be to hop out of that and be all, “Yeah. I rode here in a helicopter. Whatevs.” Photo courtesy of Alonzo Wright. You’re on the Las Vegas Strip. EDC is at the Las Vegas Motor Speedway. Art Department goes on in two hours. You gotsta get there. You’ve got a few options to explore, none of which involve hitchhiking or riding any sort of animal – much to our dismay on that last one. Until the speedway gets the picture and starts accommodating llama parking, we’ll have to settle for the better options. Shuttle passes are still available from certain locations on the Strip and downtown. 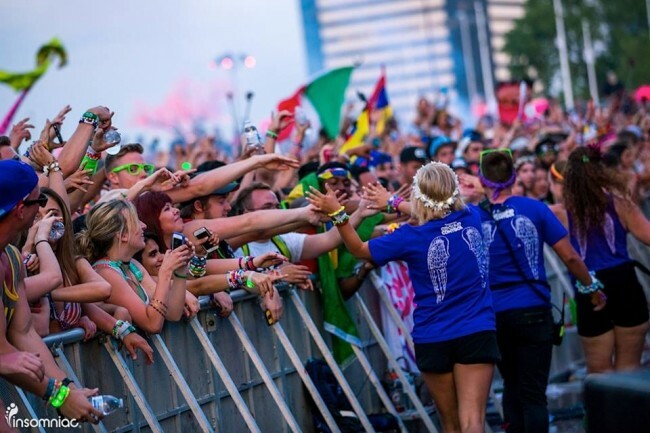 Buying a wristband lets you ride the shuttle to and from EDC all three days of the event. Passes run about $100, but that’s way less than a taxi. Taxis, limos and your friend’s mom’s minivan are always options too. There are dedicated guest drop off and pick up spots, so be sure to follow the signs and get to the right location before jumping out of the car and slamming the homemade vodka-Red Bull you brought to pregame. If you’d rather do that in the comfort of AC, you can also park yourself. Parking is an adventure in Vegas on the best days. We’ve got garages with beautiful views and garages that we’re pretty sure are portals to another dimension where the traditional laws of time and space do not apply. At EDC, parking is somewhere between the two concepts. Thankfully, the routes are direct and the parking is pretty clearly marked. We’d also like to echo the festival’s suggestion and say please carpool. It cuts down on traffic, gas and pollution. Plus you have a much better chance of being one of the people who just gets to bump in the back seat all the way out there instead of being the one behind the wheel. Helicopters exist too. You already knew that, of course. But they’re actually an option for getting to EDC. 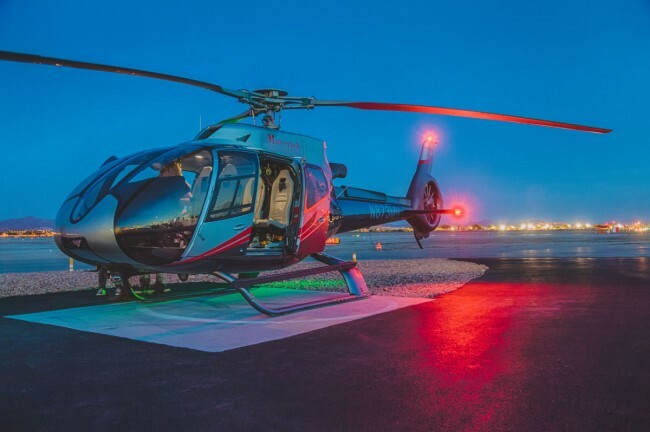 Maverick Helicopters are offering private and group rides to and from the grounds. They are expensive. They are selling quickly. But if you want to arrive in the most style possible, short of trotting up on a bright pink llama, chopper is the way to go. This food is from the VIP area. But even if you’re not a VIP you can find some good grub. Photo courtesy of Insomniac. Food: Because it’s food, do we need to write more for this one? 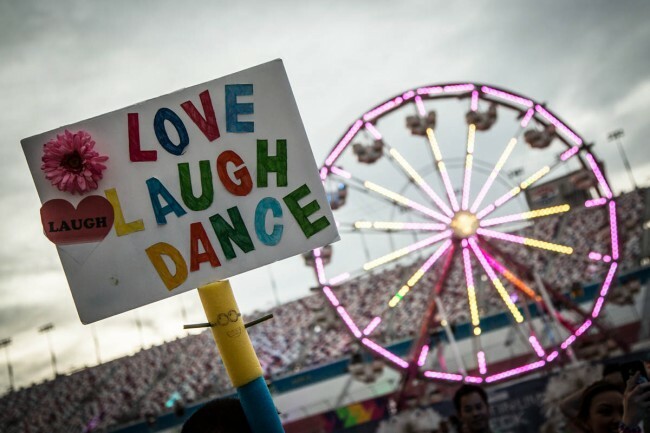 We’ve said it before and we’ll probably have to say it again because we know some of our audience is still dealing with the ringing in their ears from last year’s EDC. 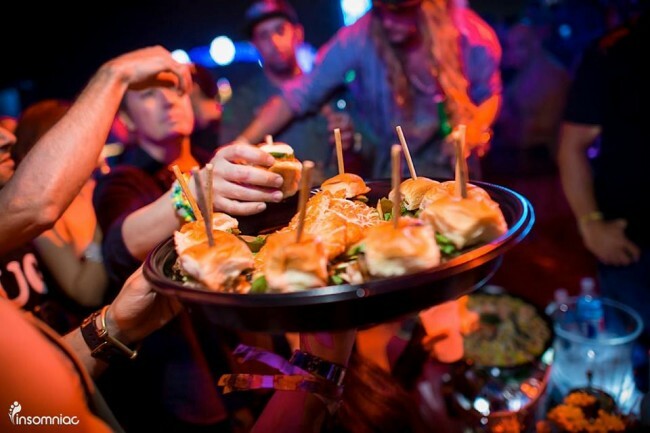 Eat food while you’re partying all night. It’s important to keep your energy up so you have the stamina to jump on a stranger’s shoulders and scream loudly enough for Calvin Harris to hear you from the stage. Thankfully, Insomniac knows the deal and will have a ton of food booths and roaming vendors throughout the festival grounds to keep your belly full and your blood sugar at that perfect ‘go crazy but don’t spew’ level. If you’re already in on the VIP or Marquee Skydeck tickets, you can grab a nice sit-down meal at the VIP Café Terrace. You can get either a three-day VIP café meal ticket for $88 that gives you access to the café and three meal vouchers per ticket or pop for a three-course seated dinner for $140. Enjoy a private VIP table overlooking the kineticFIELD. If you want to be the kind of person who eats a three-course meal at an outdoor EDM festival in Las Vegas, this is the deal for you. We’d also like very much to be your friend. If you’re just a regular attendee — which is still totally respectable — you can enjoy a variety of food trucks including the organic 50 Shades of Green, gourmet burgers from Baby’s BadAss Burgers, seafood fare from Cousins Maine Lobster, Tex-Mex inspired Senor Blues, healthy yogurt parfaits from Bowl of Heaven, frozen drinks at Longshot Coffee, delectable rice bowls from Angel’s Fried Rice. And those are just the new ones. They’ll be many, many more out there. But all that just takes care of your much needed in-festival munchies. When you get back to the Strip after a long night of dancing and you’re dreading the coming of the sun, you need some good food without delay. This is a 24-hour town. We’ve got your tummy covered. That should be enough to get you started. If you’re still hungry, you can always order room service at whatever hotel you happen to find yourself staying in. But if it’s not actually your room, at least leave a couple bucks for the person who has to pay the bill. Ground Control doing their thing. Give ’em a high five for doing their awesome jobs. Photo courtesy of Insomniac. You have to stay safe. That’s not a suggestion, it’s an order. We’re your friends and we care about you – as much as a website can care about readers it’s probably never going to meet in person. But we do care. When you’re out at EDC, pay attention to yourself and your friends. Watch for signs of dehydration, heat exhaustion and, we’re sorry we have to say it, overdose. A simple way to avoid that last one is to not do drugs, but we’re realists over here. And watch your alcohol intake too. If you start feeling sick, if you see someone throwing up, having a seizure, stumbling around or anything else that any decent human being would react to with empathy and concern, get help. Medical tents are set up throughout the grounds. They have trained staff who can help with everything from emergencies to general feeling-badness. And it’s totally free. You can also flag down a roaming medical team who will be out and about looking for anyone who looks too out of it or about to collapse. They’re all present for your safety and protection, so don’t hesitate to use them if you need to. And if you need some friendly attention or assistance with anything non medical, EDC has their Ground Control team walking throughout the festival to help. With their bright purple shirts, they’ll be some of the least flashy people there, so pretty easy to spot. You can bring signs. You cannot bring your own Ferris wheels. Photo courtesy of Insomniac. What to bring: The cans and can’ts about cans and cats. Knowing what will get you stopped at the security entrance and what will get you waved on through is important. You do not want to be that person who’s stuck arguing with the bouncer over whether or not the sweet totem you stayed up all night making is 9’11” or 10 feet. As we’ve pointed out many times before, you will lose every argument with a bouncer. So to help you out, we’re finishing off today’s post with some of the things you can and can’t bring into EDC. Laser pointers and air horns – seriously people it’s gonna be loud and lasery enough. The list does go on a bit longer and you can read it all on EDC’s site. And we’ve got loads more tips on our EDC page. But we thought it was important to remind you that, while you are absolutely going to go crazy and freak out and have the time of your year until next year, it’s a festival and a business and a place with rules too. That was a lot of ands because there’s a lot to see, do and be aware of with regard to EDC. Just keep it cool, have a good time and leave your massagers at home, or in your car if you parked in the lot – probably not in your friend’s mom’s minivan. That could get awkward.